Universal Perfect Brow Kit for the Creation of Naturally Beautiful Brows! Brenda Christian Brow Essentials In One 3-Step Kit. Universal Brow Definer, Perfect Brow Gel, Precision Blade Sharpener, and a “How To” Brochure all in a Reusable Airline Travel Approved Vinyl Pouch. 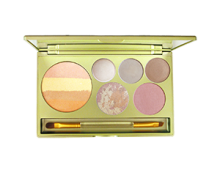 Brenda Christian Brow Essentials in one 3-Step Kit! 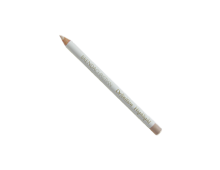 1 Universal Brow Definer – The Universal Brow Definer is a remarkable one-color eyebrow formula in a convenient pencil form that scientifically reads and automatically color adjusts to the pH of your eyebrow hair follicle. The Definer will not work on your hand or other areas of the face but is specifically designed to simulate eyebrow hairs. Upon touching the eyebrow area, Universal Brow Definer automatically adjusts from light to dark, warmer or cooler, to all natural eyebrow hair shades including Platinum Blonde, Soft Auburn, and deepest Brunette. To use, begin with a clean eyebrow area. Just apply Universal Brow Definer to the eyebrow in very short, firm strokes working in the direction of the brow hair’s natural growth, forming tiny little strokes from the roots. 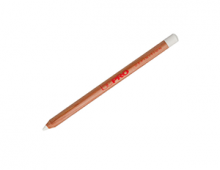 Stroke the Definer into brow areas where you have any voids. Then stroke through all natural eyebrow hair in order to blend and perfect your color and shape. Then press the Perfect Brow Gel through eyebrow area to groom and set natural brow hair and to define Universal Brow Definer strokes, giving a three-dimensional effect. 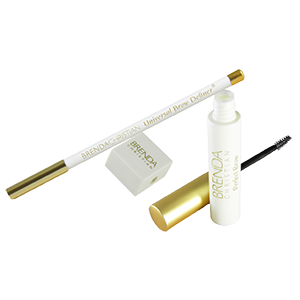 1 Perfect Brow Gel – Perfect Brow Gel is a clear, natural gel fixative designed specifically for the texture of eyebrows. After applying the Universal Brow Definer, take the Perfect Brow Gel and press over the Universal Brow Definer with medium pressure to set new eyebrow strokes and separate each stroke into tiny natural looking hairs. Perfect Brow Gel holds natural eyebrows in place, sets newly applied brow hairs, and will never look shiny. Perfect Brow Gel is designed for sensitive skin and is fragrance free and hypo allergenic. One tube should last about three months with daily use. 1 Precision Blade Sharpener – Our highest quality blade sharpens removing tiny amounts of Universal Brow Definer pencil, enhancing the life of your Universal Brow Definer. Universal Brow Definer and Perfect Brow work together and gently morph to your perfect brow hair color, ranging from Swedish Blond & Auburn to rich Brunette and African American Ebony. Perfect Brow is designed for sensitive skin, is fragrance free, and is hypo-allergenic. One tube of Perfect Brow Gel should last about four months with daily use.